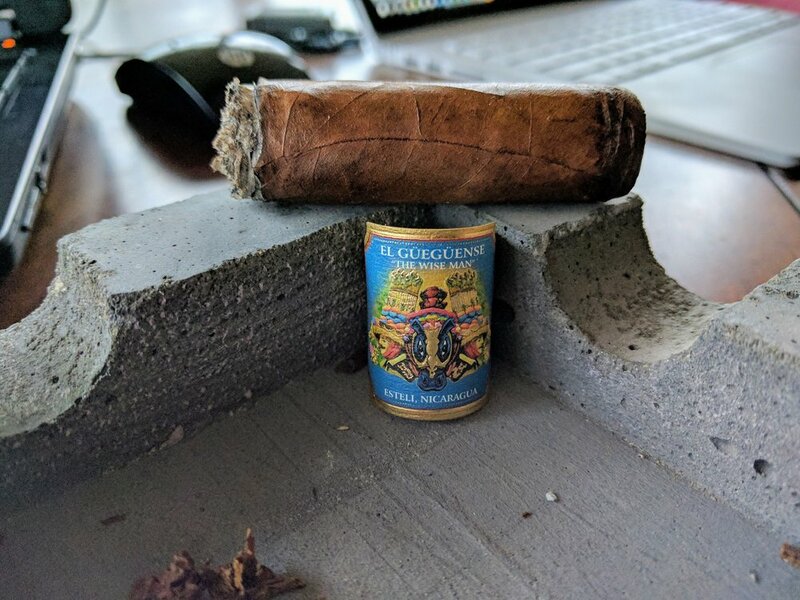 The El Gueguense line is the first produced by Foundation after Nick Melillo left Drew Estate in 2014. Cigar is made entirely with AGANORSA tobacco. According to Foundation’s website the horribly difficult to spell/pronounce name finds its origins from the indigenous people of Nicaragua’s sarcastic name for the Spanish explorers – ‘el gueguense’ – which means ‘the wise man’. It is considered the culture’s “signature work of drama, the ultimate expression of [their] unique history, language, dance and culture.” During the Gran Baile, participants wear brightly colored, eccentric costumes – as shown on the cigar’s band. Interestingly, Melillo knew that growing wrappers in Nicaragua’s sun-intense environment is very difficult but elected to maintain his devotion to the region by growing in shade conditions and negotiating with fact that the wrapper will burn a little unevenly, requiring some touch-ups – he just felt the flavor profile was worth it. I really like when a cigar’s band has a little logic to the design. Stemming from the gueguense history, the band is brightly colored and features a traditional costume worn for the celebration. The band is not going to win any awards but it does reinforce the cigar’s concept – which gets it a high rating from me! The cigar looks and feels very well crafted. A couple good sized veins throughout but relatively low giving it a smooth texture. The cap is nicely done – as is the foot, which looks packed well and uniform except for a couple little gaps. The cigar feels very firm with no soft spots – which helps reinforce the notion of a solid, uniformly constructed cigar. 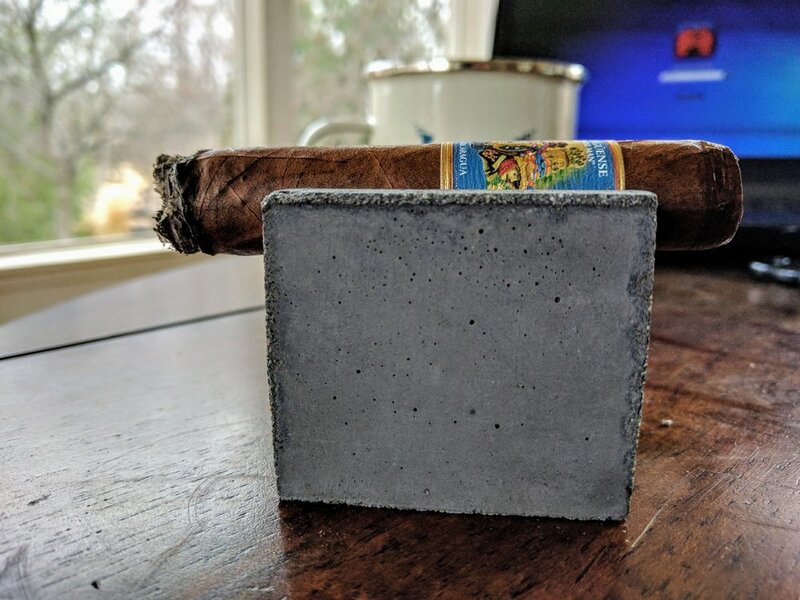 The vitola, corona gorda, feels absolutely perfect in the hand – perfect ring gauge and weight for my taste. Strong tobacco on those nose backed by notes of spice (like cinnamon) and some cedar. Cold draw is fantastic. It’s dense and a little hard to pull but it feels perfect. Some definite strong tobacco notes mixed with leather and cedar. Leaves a sweeter, raisiny taste on the lips. Snip the tip, toast and fire it up with my single torch lighter. Some definite pepper hits you right off the bat. The cedar notes also continue mixed with some slightly sweet creaminess. Smoke is minimal. While resting, you would never know it’s lit. While smoking, it puffs out enough smoke to be satisfying but it’s certainly not a chimney. 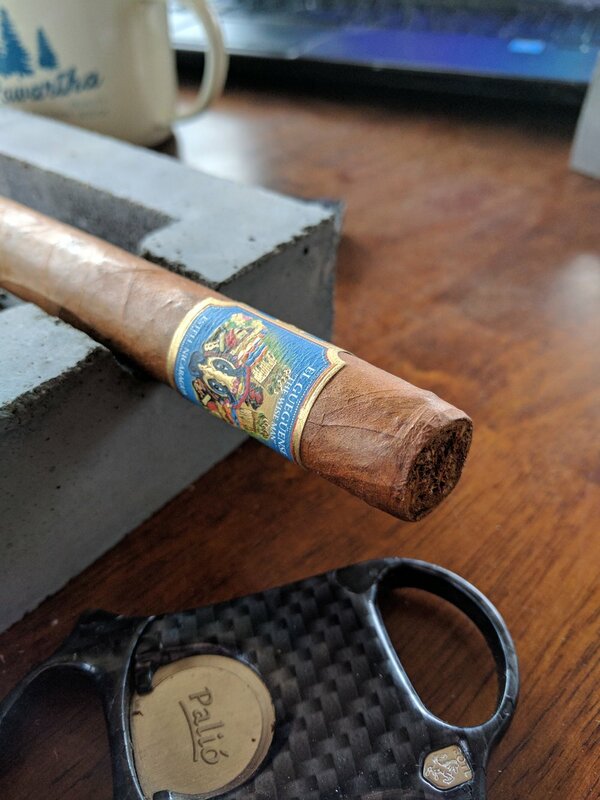 The cigar mellows out a bit as it gets into the first third in earnest – good to note though that it is very flavorful – don’t think ‘boring’ mellow. There are still prominent pepper notes with an underlying creaminess. The wrapper is burning unevenly at times but seems to correct itself – no touch-ups required so far. Well-layered grey/white ash stacking nicely – but deliberately ashed to avoid some uninvited lap ash. As I get into the second third, the pepper is gone. Its transitioned to a smoother profile with some notes of high-percentage cocoa chocolate. Halfwheel notes some barbecue spice and I kinda get that – maybe like a rib rub or deep caramelized bbq sauce. Maybe some very subtle vanilla sweetness too. Again, leather notes are present. Burn continues to be consistent and sharp; draw is flawless. 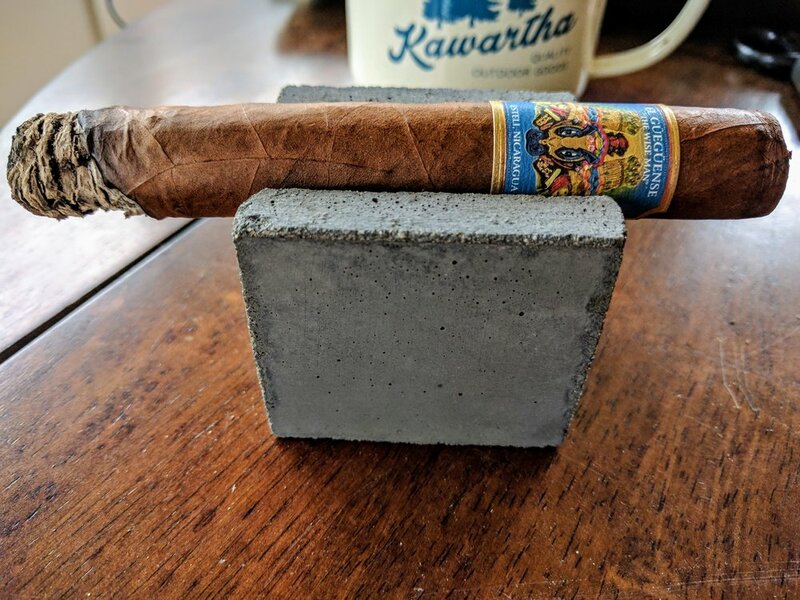 Side note: I know Dave (from Cigar Noise) notes in his reviews a heavy dose of cherries in the second third of the robusto vitola and I just can’t find it in the corona gorda. Maybe it’s a minor difference in the blend, leaves used or just my palate – I even went and ate a cherry to try and compare. I can note the same bitterness in the aftertaste of a cherry but not the upfront sweetness at all. Smoke! Suddenly, out of nowhere, this thing is a chimney! I’m getting some red pepper and spicy notes. Also some nut flavors – maybe walnut, pistachio and/or cashew. The sweet tones present throughout the smoke are still there but on a much more muted level. About midway through the third, it finally needed its first touch-up – not a problem considering it’s performed flawlessly so far! Working down to the nub, this thing has been consistently great. Great cigar overall! Flavors were a little muted in my opinion but definitely easy to distinguish at times. 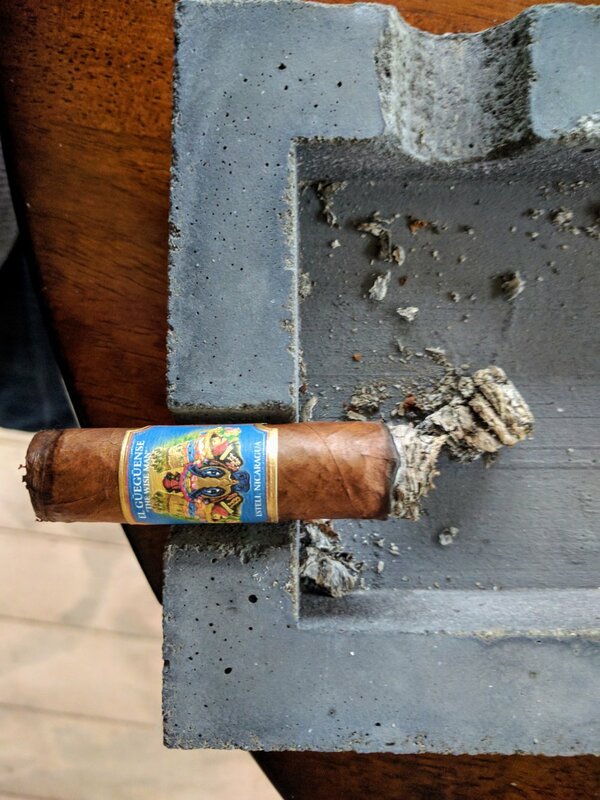 Very well made and smoked nearly perfectly – it was a great cigar to enjoy while doing sitting outside working on some drawings. I admire the dedication to using purely Nicaraguan leaves and I think the result was a very unique experience. I would not hesitate to smoke one again, but probably won’t be seeking one out any time soon. If you particularly enjoy Nicaraguan smokes, this is the one for you! 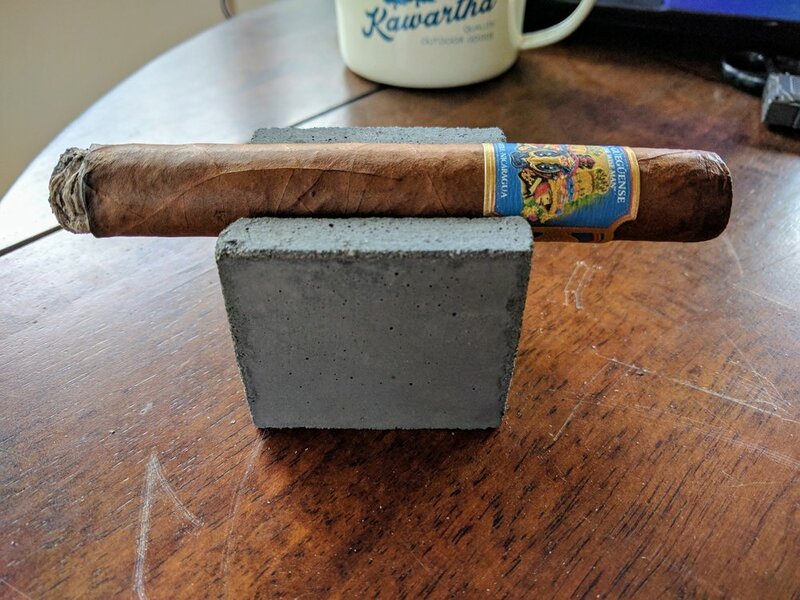 I found four reviews or ratings for the corona gorda El Gueguense from Foundation. They averaged out to be about a 9.03 which amazingly is exactly where I rated the cigar - a 9.03! Looks like we're all on about the same page!